Join UNCLE PETE and EL VATO this Saturday (January 14, 2012) as they venture into the realm of the Spaghetti Western for the brawl-packed, lead-flyin’ feature: It Can Be Done Amigo! 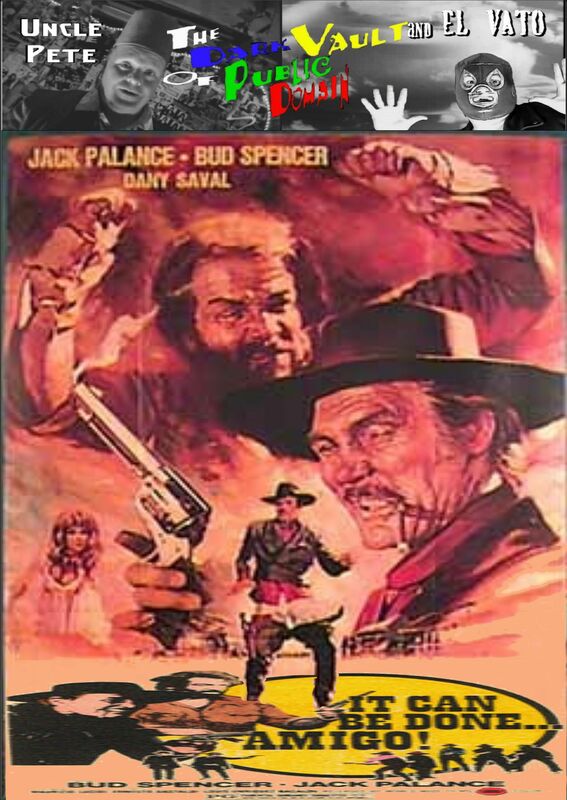 From 1972, it stars Bud Spencer as Coburn, an affable, two-fisted drifter, and Jack Palance who not only happens to be the fastest gun in the west, but is also aimin’ to use his talents to get revenge on Coburn for besmirching (in the Biblical sense) the name of Palance’s sister – even though Coburn claims the besmirchin’ was just a misunderstanding. But to make the sauce, er, plot even thicker, a dying old man makes Coburn promise that he will see to it that the old man’s orphan nephew takes possession of the land he is leaving to the boy. Brawls, bullets and comic mayhem ensue in this great action flick from director Maurizio Lucidi. Plus, UNCLE PETE demonstrates some of the dramatic eye twiches and cigar shiftin’ that legend has it he taught to Clint Eastwood just before Eastwood’s meteoric rise in the world of Spaghetti Westerns. So grab your panchos, well chomped on cigars and put in a good supply of Pepe Lobrow ™ and barbecue spaghetti sauce for this Saturday night’s feature – It Can Be Done Amigo! – starting at 10PM on THE DARK VAULT OF PUBLIC DOMAIN! ~ by UNCLE PETE on January 13, 2012.